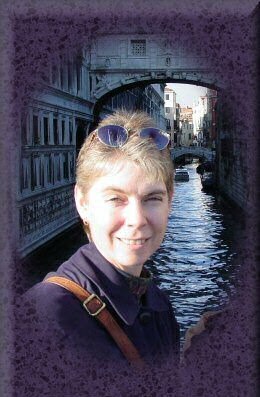 Welcome to the first day of Clare B. Dunkle's tour for THE HOUSE OF DEAD MAIDS. Her next stop is The Compulsive Reader. 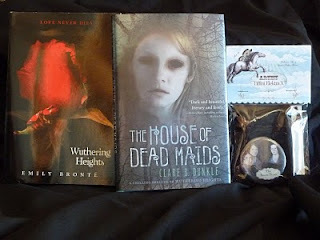 THE HOUSE OF DEAD MAIDS by Clare Dunkle (Holt/Sept) is a scary blending of Yorkshire lore and Bronte family history. A child, who will later come to be known as Heathcliff, is already a savage little creature when Tabby Aykroyd arrives at Seldom House as his nursemaid. The ghost of the last maid will not leave Tabby in peace, and her spirit is only one of many. As she struggles against the evil forces that surround the house, Tabby tries to befriend her uncouth young charge, but her kindness can't alter his fate. It's a quick, chilling read and makes for a perfect companion to Wuthering Heights. It really whets the appetite for the classic novel. Considering I am an English major and I've done quite a bit of work with British literature, I was intrigued. Plus, while Clare clearly loves WUTHERING HEIGHTS, it appeared that she wasn't going to fall into the trap of over-romanticizing Heathcliff. (Read my review, posted later today, to see whether she suceeds.) Because Heathcliff is one of the creepiest men in literature, whether he's part of a love story or not. Heathcliff, the hero of Emily Brontë’s novel, WUTHERING HEIGHTS, has a complicated relationship with his sweetheart, Cathy. It’s so complicated that readers are still arguing over whether or not that book is a love story. Cathy herself can’t manage to put into words what Heathcliff means to her—especially since she wants to marry someone else. But each time Cathy tries to talk about Heathcliff, she ends up talking about death. And more than just death—ghosts... graves... never parting. This sounds like the manifesto of any passionate young woman, claiming that she and her lover will remain together even in death. But the crazy thing is that Cathy and Heathcliff aren’t together. Cathy has already agreed to marry Edgar Linton, who (in her words) is handsome, rich, and pleasant to be with. Even after she becomes Mrs. Linton, she isn’t sorry. She can talk happily about Edgar and her having half a dozen sons together—even when she’s talking to Heathcliff! So why does she talk about not resting in her grave until Heathcliff is with her? Did Heathcliff and Cathy make a pact when they were children to remain together at Wuthering Heights after they die? But Heathcliff takes too long to die. Cathy’s ghost comes looking for him. Inspired by this strange story of undying love, I’ve written a prequel to WUTHERING HEIGHTS—Volume One to Emily Brontë’s Volume Two. In my book are plenty of ghosts, and a grave, and something that might have been undying love once, but now it’s closer to undying hatred. Into my grim story comes Heathcliff as a little boy, and he just loves the place. My book doesn’t explore what happens when Heathcliff and Cathy make their deathless pact. It ends before they meet. But it does explore what might lead Heathcliff to make such a pact—and why he knows it will work. 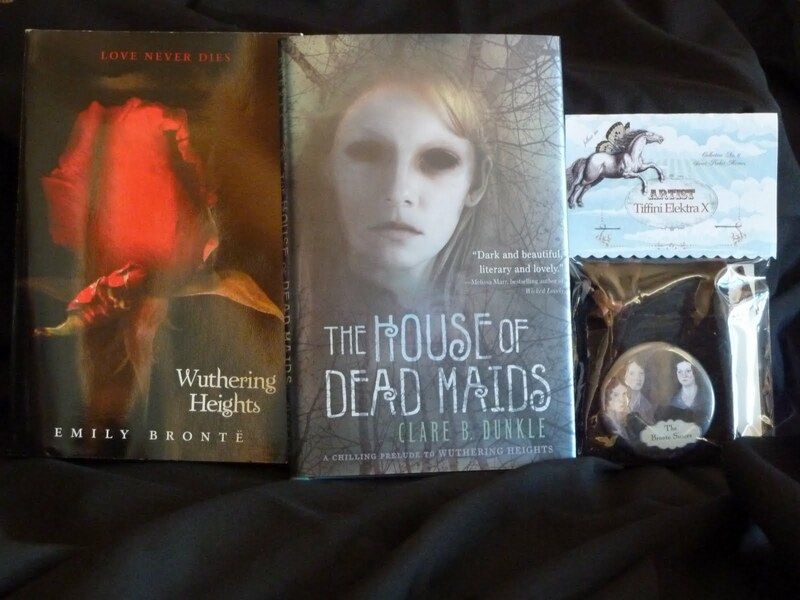 One Grand Prize winner will receive THE HOUSE OF DEAD MAIDS, a gorgeous Brontë sisters pocket mirror, and the HarperTeen edition of WUTHERING HEIGHTS! Two lucky runners-up will receive the two books. To enter, send an email to DeadMaidsBook@gmail.com with your name, email address, and shipping address (if you're under 13, submit a parent's name and email address). One entry per person and prizes will only be shipped to US or Canadian addresses. Entries must be received by midnight (PDT) on October 31. Winners will be selected in a random drawing on November 1 and notified via email.